Peaches, nectarines, and papayas are fruit jewels. 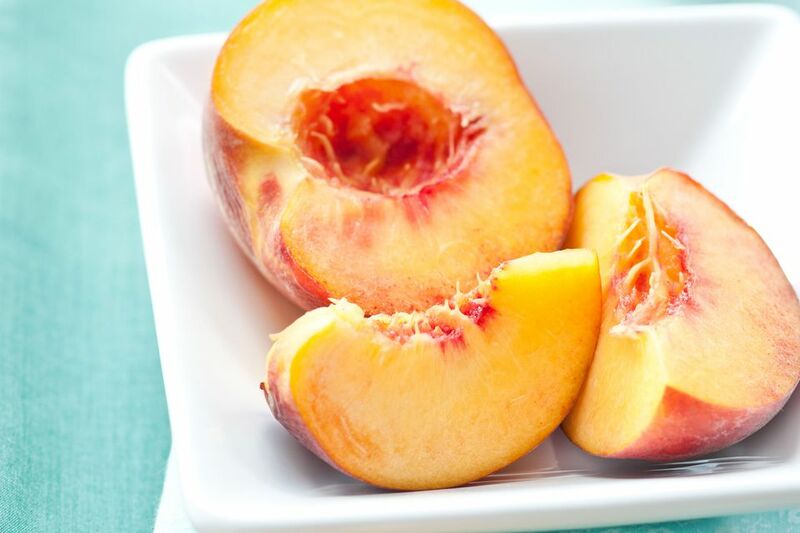 There's nothing like biting into a warm, ripe peach and letting the juices drip down your chin. Unfortunately, these same golden juices drip onto your shirt and leave a stain. Peach, nectarine, and papaya stains are much like any fruit stain. It is the tannin in the fruit that leaves the colored stain on fabrics. It is important to treat the stains as soon as possible for easy removal. Older stains are always harder to remove. First, remove any excess pulp from the fabric with the edge of a dull knife, spoon or even the edge of a credit card. Lift straight up and try not to push more stain into the fabric. Never rub or wipe. If possible, flush the stained area with cold water by holding it under a faucet with the water hitting the wrong side of the stain to force out the stain. If you can't get to a faucet, sponge the area with a cloth dipped in plain, cool water and blot dry. Next, treat the stained area with a solvent-based stain remover spray or gel. If you don't have a stain remover, use a bit of heavy-duty liquid laundry detergent (Tide or Persil are leading highly rated brands) to treat the stain. These detergents contain enough enzymes to remove the oily component of peanut butter. Less expensive brands may not work as well. Work the stain remover into the stain with your fingers or with a soft bristled brush. Allow the product to sit on the stain for at least fifteen minutes before washing. After allowing the stain remover to do its job, wash the garment or table linen in the hottest water recommended for the fabric on the care label. Check the stained area before drying. Drying the item on high heat if it is still stained will make the stain even harder to remove. If the fruit stain remains, mix a solution of oxygen-based bleach (brand names are: OxiClean, Nellie's All Natural Oxygen Brightener, or OXO Brite) and cool water following package directions and submerge the garment. Allow it to soak at least four hours or overnight and then launder as usual. If a slice of fruit falls on a garment that is labeled as dry clean only, lift away the solids and sponge the area with a cloth dipped in cool water. As soon as possible, head to the dry cleaner and point out and identify the stain to your professional dry cleaner. Don't leave the stained item in a hot car for too long, because the heat will make the stain harder to remove. If you opt to use a home dry cleaning kit, be sure to treat the stain with the provided stain remover before putting the garment in the dryer bag. When the peach or papaya cubes hit the carpet, use a spatula or spoon to lift the solids away from the surface. Then blot up any moisture that remains. In a small bowl, combine two cups warm water and two tablespoons hand dishwashing detergent. Dip a clean white cloth or soft-bristled brush in the solution. Work the solution into the stain starting at the outside edges and moving toward the center. Blot with paper towels until no more color is transferred. The next step is to "rinse" the area with plain cool water by blotting with a sponge. It is very important to remove all of the soapy mixture, because it can attract soil. Blot up all the moisture with paper towels. Allow the area to air dry away from direct heat. Vacuum to lift fibers. If any stain remains, repeat the cleaning steps. To clean fruit stains on upholstery, use the same cleaning solution and techniques recommended for carpet. Take extra care not to overwet the fabric. Excessive moisture can be a problem for cushions and filling. Allow the upholstery to air dry away from sunlight and direct heat. If the upholstery is vintage or silk, lift away the solids and blot with a damp cloth dipped in plain water. Contact a professional about a complete cleaning if you need more stain removal tips.